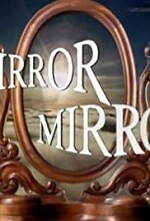 Watch Mirror, Mirror: When Jo Tiegan is given an oval-shaped mirror, as a gift, by the elderly owner of an antique shop, she is amazed to see another girl's image in the mirror instead of her own reflection. It is also quite obvious that the other girl can see her just as clearly. Jo (from the 1990's) and 'the girl in the mirror', Louisa Iredale (from 1919), later accidently find that they can also travel to each other's times through the mirror - following upon which discovery a relentless sequence of events is set in motion.